**SIS does not issue permits but will review all paperwork for your application and hand deliver it to the Office of Motor Vehicle in Baton Rouge. 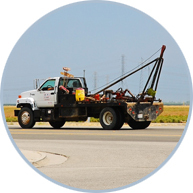 In addition to processing of paperwork, our extensive experience in the towing and recovery industry allows us to serve as a source of information for our customers regarding processing procedures and changes in the laws governing our industry. © Copyright 2011 SOUTHERN INFORMATION SERVICES. All Rights Reserved.